This USB Industrial I/O Adapter is designed to make industrial communication port expeansion quick and simple. Connecting to a USB port on your computer or USB hub, this USB Industrial I/O Adapter instantly adds and industrial multi-electrical interface serial communication port to your system. By taking advantage of the USB bus, this USB Serial Adapter makes it easier than ever to add 4 RS422/485 serial ports and serial devices to your system with easy plug-and-play and hot plug features. Plugging the USB Industrial I/O Adapter into the USB port, the adapter is automatically detected and installed. There is no IRQ & COM port conflicts, since the port doesn't require any additional IRQ, DMA or memory on the system. The RS-422/485 port functions as a native Windows COM port, and it is compatible with Windows serial communication applications. Each port is individually configurable via DIP switches on the outside of the USB-4COMi-SI box. This USB to Industrial I/O Adapter provides instant connectivity to RS422/485 communication devices for factory automation, multi-drop data collection devices, barcode readers, time clocks, scales, data entry terminals, PC to PC long distance communications, ATMs and serial communications in harsh enviornments. This USB to Serial Adapter is suitable for remote access, retail and industrial applications, data collection and other applications requiring high speed RS-422/485 communication ports. Supports RS-422 Full Duplex, RS-485 Half Duplex and RS-485 Full Duplex modes. Dimensions of 167× 99×29 mm³ (W×L×H) or 189×102×30 mm³ with DB9 connectors and ears. This adapter supplies Optical Isolation & Surge Protection. Each RS-422/485 port is individually optically isolated with 2000 volt DC optical isolation. The optical protects your PC or notebook from spikes and surges on the RS-422/485 network, by converting the electrical pulse into an optical signal and then changing it back into an electrical pulse. Your computer is well protected, since the surges and spikes cannot cross the optical link. Each RS-422/485 port is individually protected by surge protector to withstand electrostatic discharge and power surges up to 25KV ESD. Surge suppression on all signals prevent damages caused by lighning and high voltage. This USB Industrial I/O Adapter is designed to make industrial communication port expeansion quick and simple. Connecting to a USB port on your computer or USB hub, this USB Industrial I/O Adapter instantly adds and industrial multi-electrical interface serial communication port to your system. By taking advantage of the USB bus, this USB Serial Adapter makes it easier than ever to add 4 RS232/RS422/485 serial ports and serial devices to your system with easy plug-and-play and hot plug features. Plugging the USB Industrial I/O Adapter into the USB port, the adapter is automatically detected and installed. There is no IRQ & COM port conflicts, since the port doesn't require any additional IRQ, DMA or memory on the system. The RS232/RS422/RS485 port functions as a native Windows COM port, and it is compatible with Windows serial communication applications. Each port is individually configurable via included software. There are no dip switches or jumpers to deal with. 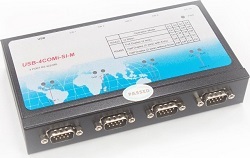 This USB to Industrial I/O Adapter provides instant connectivity to RS232/422/485 communication devices for factory automation, multi-drop data collection devices, barcode readers, time clocks, scales, data entry terminals, PC to PC long distance communications, ATMs and serial communications in harsh enviornments. This USB to Serial Adapter is suitable for remote access, retail and industrial applications, data collection and other applications requiring high speed RS232/422/485 communication ports. Dimensions of 172×95×29 mm³ (W×L×H) or 184×99×29 mm³ with DB9 connectors and ears. Comes with a USB cable & power supply (120 volt, 60 hz). Optionally DIN-rail mountable with additional mounting kit. Power: External power supply 5V DC required. Adapter included, 12V not possible. Dimensions: 167 x 99 x 29 mm (W×L×H)or 189 x 102 x 30 mm with DB9 connectors and ears. Product includes USB-4COMi-M unit, USB cable of approximately 3 feet, Power Adapter, CD with drivers and documentation. This type of power connector is used in the following countries: American Samoa, Anguilla, Antigua, Aruba, Bahamas, Bangladesh, Barbados, Bermuda, Bolivia, Brazil, Cambodia, Canada, Cayman Islands, China (without holes in blades and slightly shorter blades), Colombia, Costa Rica, Cuba, Ecuador, El Salvador, Guam, Guatemala, Guyana, Haiti, Honduras, Jamaica, Japan, Laos, Lebanon, Liberia, Maldives, Mexico, Micronesia, Montserrat, Netherlands Antilles, Nicaragua, Niger, Okinawa, Panama, Peru, Philippines, Puerto Rico, St. Vincent, Saudi Arabia, Tahiti, Taiwan, Thailand, United States, Venezuela, Vietnam, Virgin Islands (U.S.& British), Yemen. Click here to view this type of power plug.